Make a donation and dedicate it to your friends, family, or loved ones. Your gift will help change people’s lives. We will mail the recipient a personalized Nyima Card with your kind gesture. These cards can be used for birthdays, holidays, or any occasion. 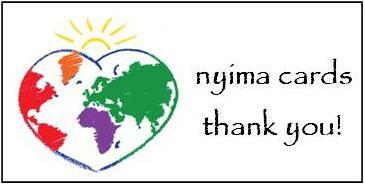 Nyima Card donations start at $25. Donations are tax deductible.